The Marcus Regency shirt I was perfection for attending a recent Steampunk street fest. My outfit was a hit! 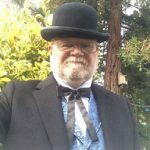 Got my picture taken a few times and even made the local arts & entertainment blog. Loved the look, the fit and it was easy to wash and wear. Looking forward to the next cosplay event I can work this into! Shipping was fantastic, I was guaranteed delivery by a certain day and received it more than a week before that date. So pleased! I adore Historical Emporium! This site is the best clothing site I've ever come across. I want to stress, I am not shopping here for costumes! This is quality apparel and I wear my purchases from Historical Emporium as part of my daily dress. I have always had a Victorian fashion sense and for years had to piece together waistcoats and sports coats that had a vintage feel to them. Finally, I have a place I can shop that carries the exact fashion I am looking for--no more piecing together whatever I can happen to find from the boring, retail men's fashion scene that pushes a drab, uniform look onto the modern male. Thank-you Historical Emporium; I am a customer for life! Fast delivery and great communication! Great return and refund policy too. I'll continue to purchase from Historical Emporium. Love the products! We have used your store before and are always pleased.